The last decade has been full of natural disasters. Due to the mainstream media, we tend to only notice the big events. We all know about the earthquakes that ravaged Haiti and Japan. We have read all about the tsunamis that took countless lives in Indonesia and Japan. And of course, we all remember the tragedy that was Hurricane Katrina and many Americans are still experiencing the aftermath of the catastrophe. However, not all disasters are on such a grand scale and cause damage to such a high degree. In Alabama, what seemed to be just a storm has grown to a full crisis in the southern state. 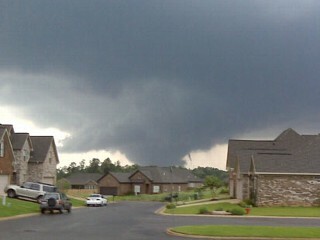 Wednesday, the storm turned into a string of tornados. By the end of the day, the death count was reported to be at the very least 58. In total, over seventy Americans have been reported dead in four states in the south as a result of the storms and tornados. Fifteen people have been reported to have been killed in Tuscaloosa, Alabama alone. The devastation grew so large that the governor of Alabama, Robert Bentley, contacted President Barack Obama and asked the Head of State to help out in the time of urgent and desperate need. Wednesday night, Obama told reporters that he did in fact talk to Governor Bentley and told him that he will approve his request for help. Obama is sending search and rescue teams and equipment as well as other disaster relief help. Obama and his wife Michelle, the First Lady, said that they are very proud of “the heroic efforts of those who have been working tirelessly to respond to this disaster,” and that with the work of the Federal Emergency Management Agency, the crisis will hopefully not get out of hand. All eyes are on the south this week as millions of Americans watch closely and hope that the worst of the storms and tornados is in the past and that no more lives are lost in the coming days. As rescue teams continue to search the south, the only thing Americans can do is hope that more survivors are found than casualties. For the next few days, all we can do is wait and see.